Radio Swadesh Bangladesh FM Live Online . Listen Bangladesh FM Radio Stations Live Streaming Online . Enjoy Live Stream of bangla Music live 24 by 7 . Listen Bangladeshi Music and news 24 by 7. 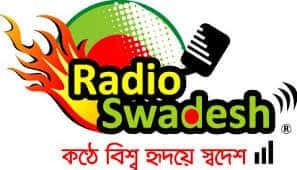 Radio Swadesh is the popular internet radio in Bangladesh, broadcasting 24 hours live program on Internet. The mission to represent Bengali culture, targeting the listeners who speak Bengali and reside both inside the country and abroad. It is the first online commercial radio station in Bangladesh . Bangladesh Favourite Bangla Music Radio Station Online . Listen to Hit Music, Movie Reviews, Celebrity Interviews, RJ shows and more . Address : Living Dhara, 5th Floor, House-12, Road-2, Block-J, Baridhara.Dhaka-1212.